The bus laying over at Chester Transportation Center. 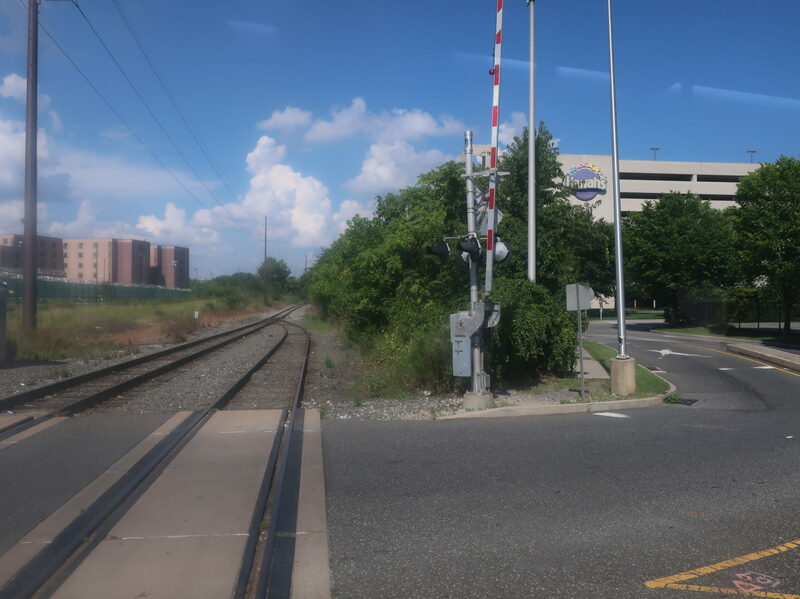 Going towards Chester, the bus appears to do a small loop north of the Regional Rail tracks, for some reason. According to Google Maps, this does not happen. Beats me. Going away from Chester, though, we just headed straight onto the route, like you would expect a normal bus route to do. We began on Avenue of the States, which was lined with buildings – some contained businesses, some were vacant. 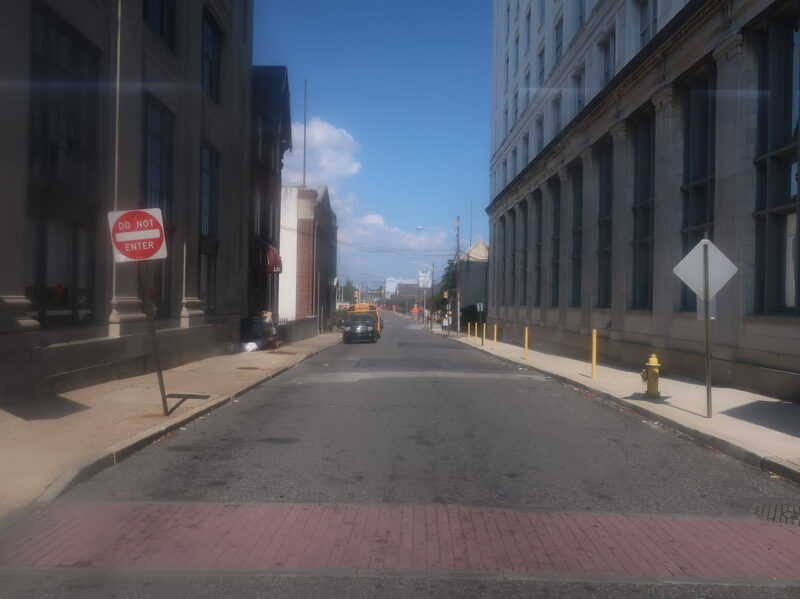 Avenue of the States ended at Chester’s modern city hall, at which point we used 4th Street and Welsh Street to get onto a road known only as Route 291. It ended up becoming 4th Street a few blocks later, anyway. We had definitely left downtown Chester at this point, as the wide road breezed past industrial lots and vacant land. Outside of a prison, we used Morton Ave to deviate to Harrah’s. The bus stop was next to the casino’s parking garage. A level crossing before the casino. We came back to East 4th Street, which became increasingly highway-like as we came alongside the Northeast Corridor tracks. We entered Eddystone upon crossing Ridley Creek, where the road got the fitting name of Industrial Highway. Indeed, after going by Eddystone Station (one of the least-used on Regional Rail), there was a ton of industrial development, including two power stations! After crossing Crum Creek, the factories turned into office parks, specifically a giant Boeing complex. We went over another creek, Darby Creek, into Tinicum Township. There were a few “airport” developments like hotels and parking lots, and the wide highway became Governor Printz Boulevard. The road split into two one-way segments, and though the scenery was still really industrial, a few unfortunate houses and apartments were squeezed in between the auto shops and warehouses. The side streets were generally more residential. You enter a much nicer neighborhood if you go far enough down this side street! We soon entered a marshy industrial wasteland. All weekday trips turn onto Stevens Drive to deviate into the “Airport Business Center,” which is basically just three office buildings. 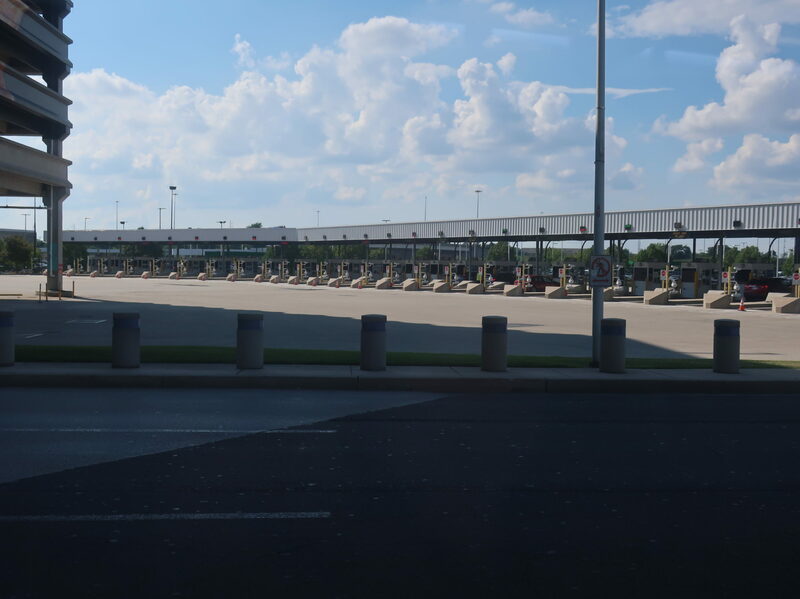 We were truly in airport-land after we crossed some freight tracks, with a ton of parking lots and highway ramps everywhere. At the intersection with Bartram Ave, the long deviation to the airport terminals began. On weekdays, buses do an additional deviation-within-a-deviation to International Plaza, an office park. We made our way onto the main arrivals road (also known as…Arrivals Road). Nearly this whole segment was spent underneath parking garages serving the various terminals. Terminal A had its smorgasbord of international airlines (plus American), Terminals B and C were all American, Terminals D and E had the airport’s non-American domestic offerings, and Terminal F was American Eagle, a subsidiary of…American. If it isn’t obvious, American offers a lot of flights out of Philadelphia. Talk about a toll booth! This is to get out of the airport parking garages. 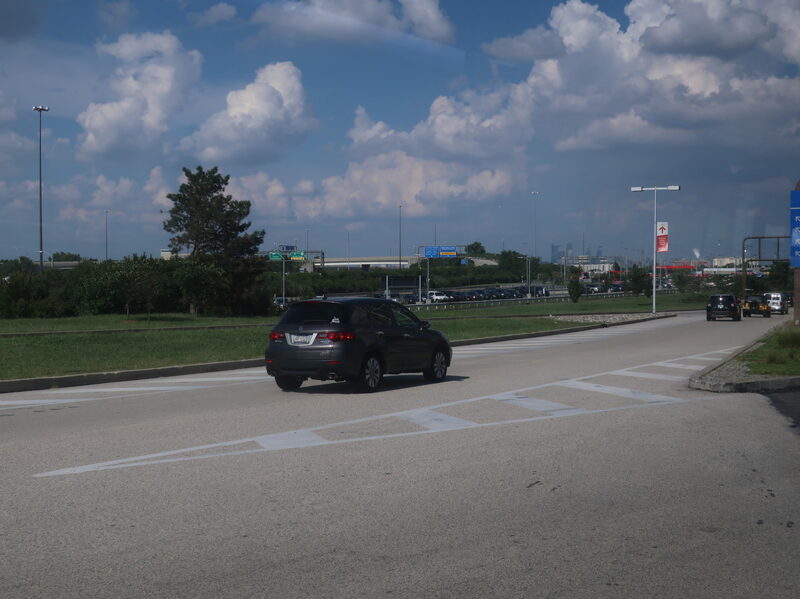 Leaving the terminals, we passed the giant Economy Parking lot and made a hairpin turn onto Airport Recirculation Road. It led us past all the car rental places before dumping us off at the intersection with Bartram Ave where we had initially started. We turned onto that, and it was basically a highway running through marshy, disgusting woods. Who is this practically inaccessible shelter for? I have no idea. A bunch of airport hotels showed up, and at this point, we turned onto 89th Street. This was a deviation to serve PNC Operations, a PNC Bank office. I’m not sure why this place gets deviations on weekends; on the Sunday I rode, no one got on or off here. 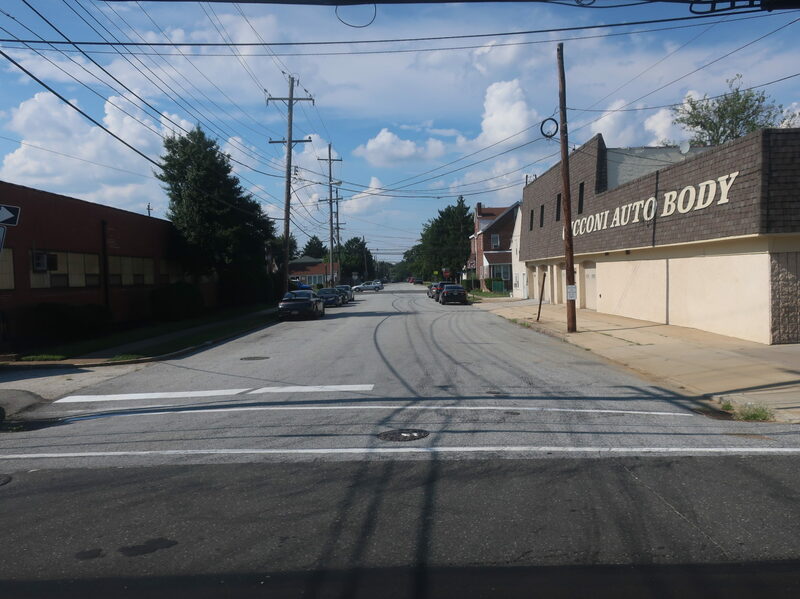 After that, we headed up Tinicum Boulevard before going back onto Bartram Ave. Passing Eastwick Station on the Airport Line, we turned onto 84th Street, which crossed over the Regional Rail tracks. 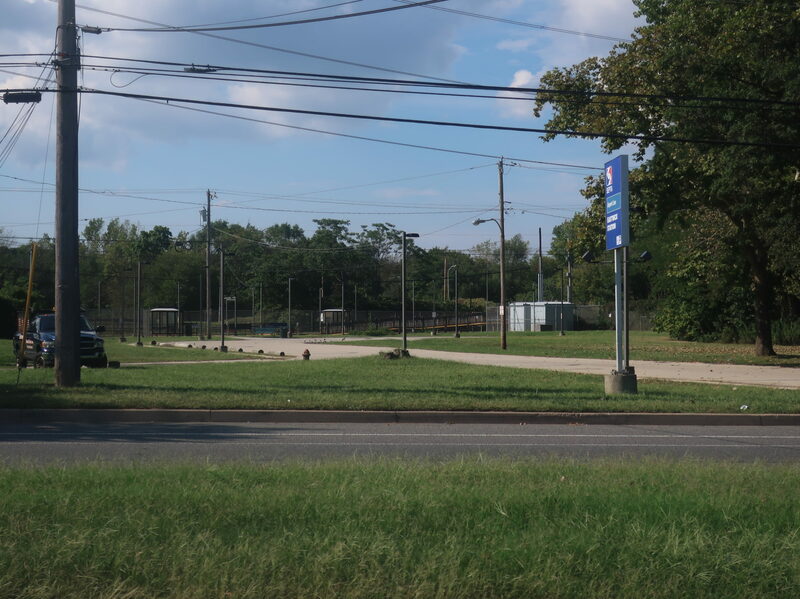 We stayed on 84th until Lindbergh Boulevard, and we were now in a very odd part of Southwest Philadelphia. Both 84th and Lindbergh were giant roads, with express lanes in the middle and local lanes on the outside, separated by a grassy median. We actually travelled in the express lanes, since the local ones are really just meant for people parking at the austere row houses that line the road. This means that each bus stop is essentially on the median, requiring people to cross a small street to access. 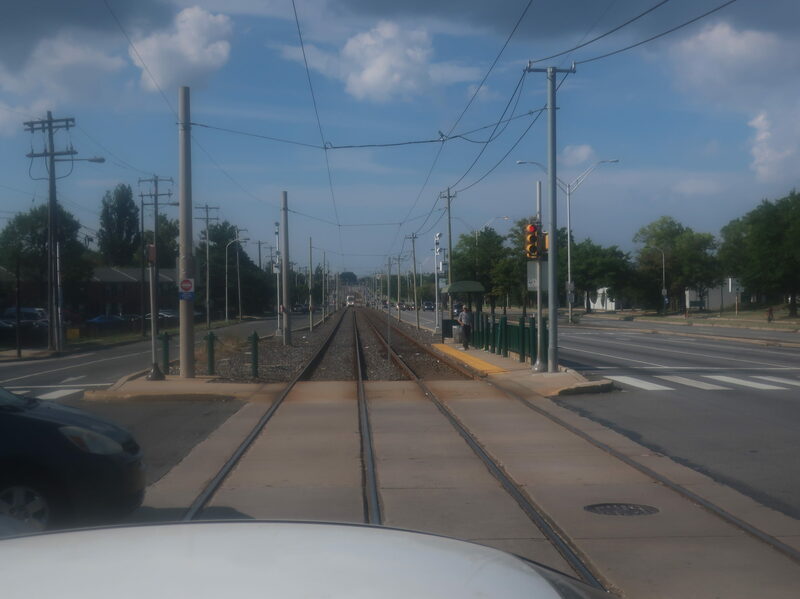 At Island Ave, we came across some suburban businesses and…a trolley? Yeah, the 36 trolley runs down here, and it looks really out of place amongst the sprawl! 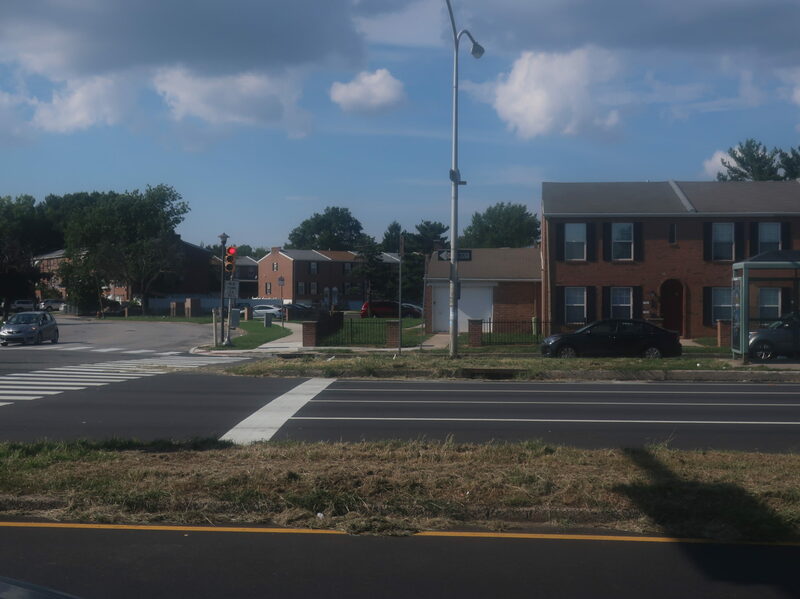 Continuing onward, Lindbergh Boulevard had more row houses to the west, but the east side was now industrial. The road made an s-curve further into the residential neighborhood, and so for a little while it was all apartments. Yup, this came out of nowhere. We turned onto 61st Street, heading back east into the wasteland of industry again. In this case, it was specifically a ton of auto scrap yards. It ended at Passyunk Ave, onto which we turned, crossing a bridge over the Schuylkill River. 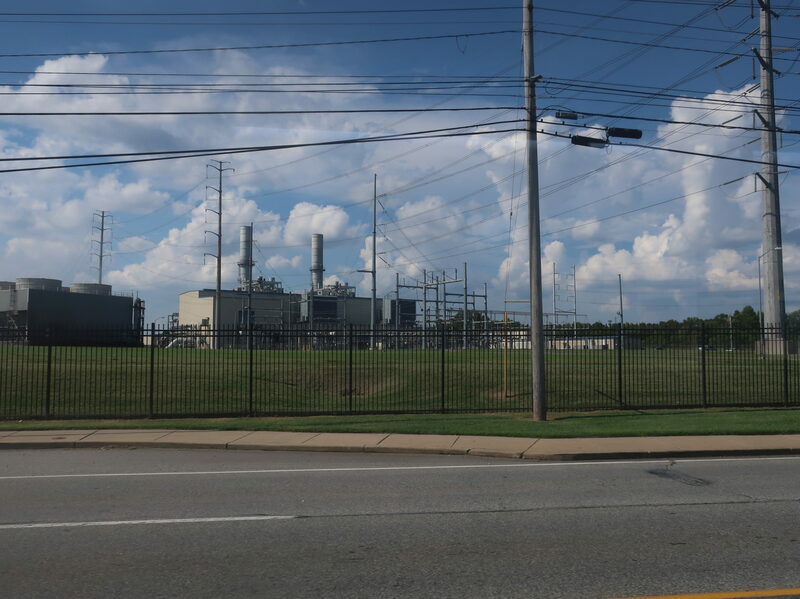 The other side was basically just a sprawling desert of the most unimaginably ugly industry you’ve ever seen. For anyone coming from the airport, Philly is nice! I swear! We went under I-76, passed a few suburban businesses, and we were finally in the first proper neighborhood since…I dunno, Chester? Barely. Well, anyway, we were now in the dense apartment and retail grid of South Philadelphia, through which Passyunk Ave runs diagonally. 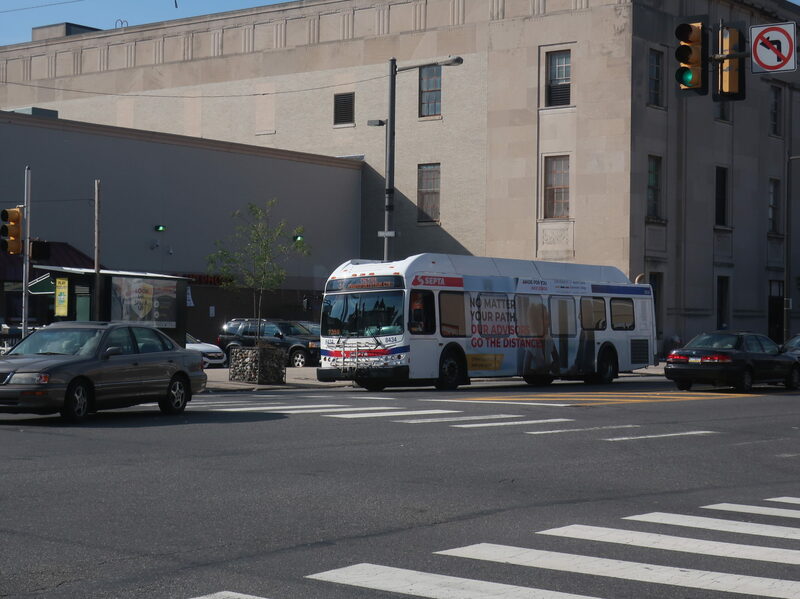 Suddenly, we hit a wall of businesses at Broad Street, and this is where we turned to reach our final stop at Snyder Ave.
Wow…the bus I took was 8435, and this one is 8434! What a coincidence! Ridership: This is a tough route to get efficient ridership on. 3,424 riders per weekday doesn’t seem very high, but it averages out to around 30 people per trip. Hey, that’s not bad, right? Oh wait, the route is over 18 miles long. As far as I can tell, this thing doesn’t get especially crowded at any particular time, since everyone is split up over that giant distance. This leads to an embarrassing farebox recovery ratio of 17% – one of the very lowest in Philadelphia. Pros: Because it’s a very long route, the 37 does a lot. 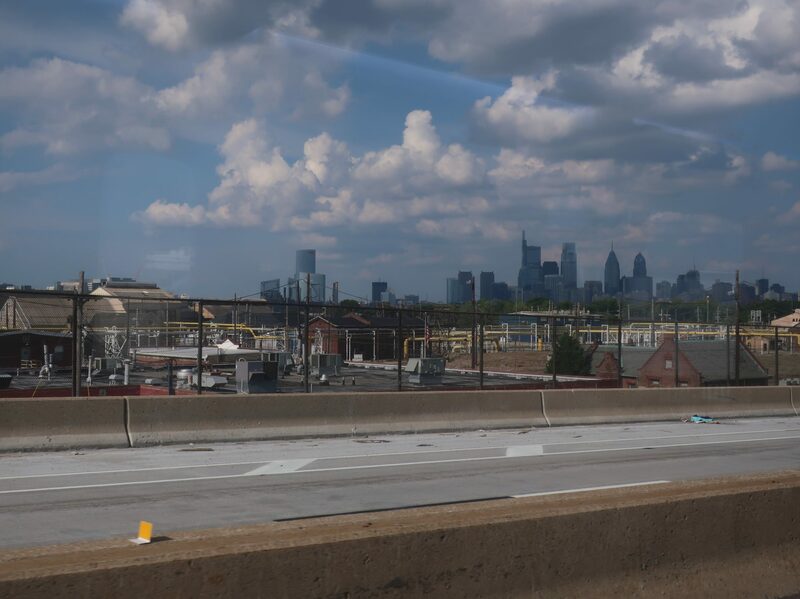 It connects up Chester, Southwest Philadelphia, and South Philadelphia to each other, as well as to the airport. 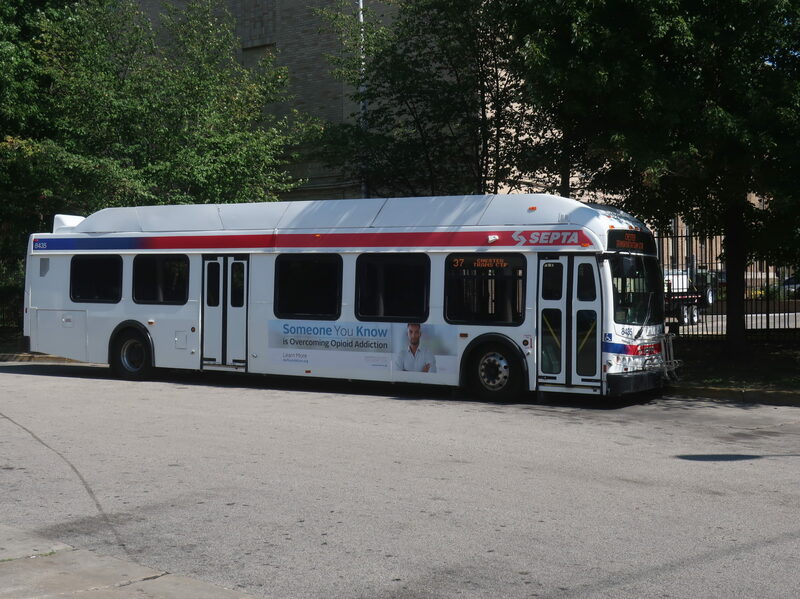 For such a long route, it also runs with surprisingly good frequency: outside of rush hour, buses run every 25 minutes seven days a week, although on weekends, every other bus only runs from South Philly to PNC Operations. There’s even Owl service on the route, with a bus every hour all night. Cons: Wait, hang on, why does the night service only go as far as Harrah’s? They really couldn’t extend it a few minutes to Chester? If airport employees live in Chester (and I wouldn’t be surprised if some do), they could use the bus to get to their jobs in the early morning. Also, despite being very frequent (every 9-12 minutes), rush hour service is on the complicated side. 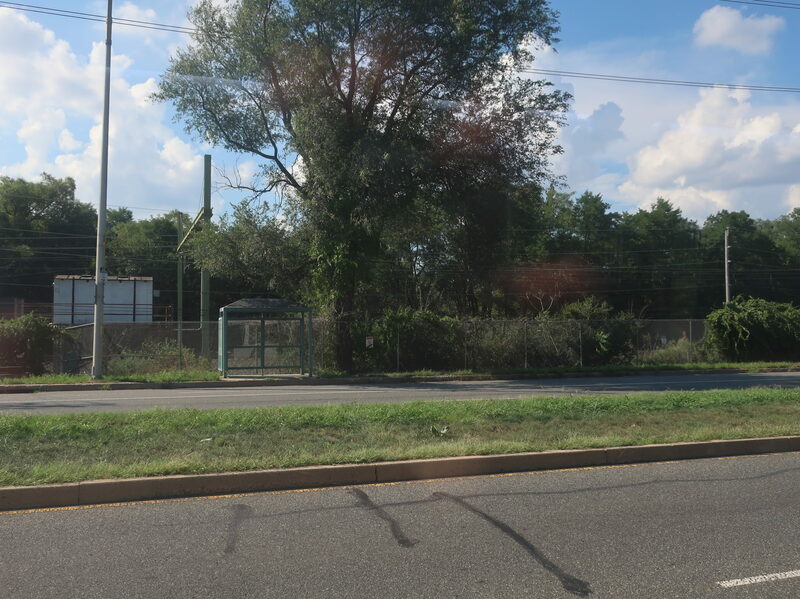 Some trips short-turn at the Airport Business Center, and others skip the residential neighborhoods of Southwest Philadelphia, opting for a routing through the Eastwick Industrial Park. At least it’s consistent which trips do which deviations and routings, but the schedule is still pretty hard to read. Nearby and Noteworthy: When my family ended up in South Philadelphia, we had breakfast at the Melrose Diner. It was really good, and super cheap! 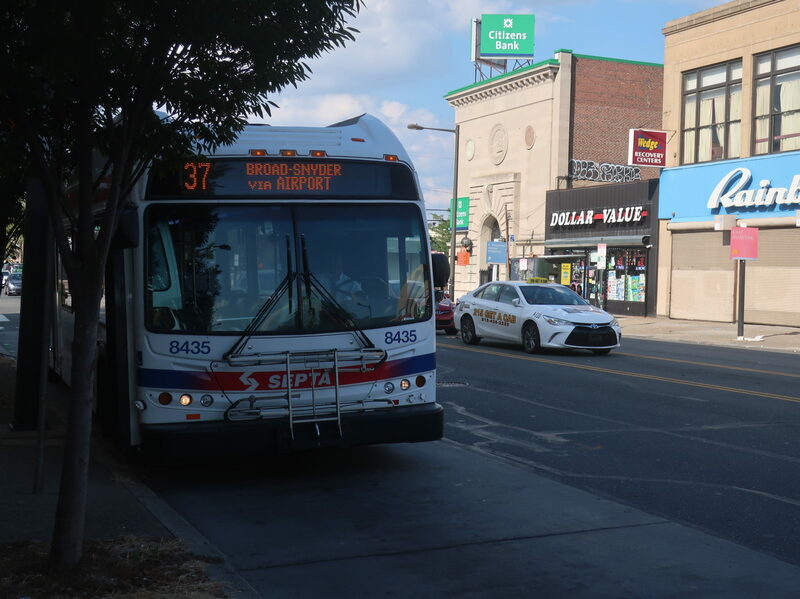 I don’t think the length of the 37 is a bad thing, per se, but it does make it a lot more expensive for SEPTA to run the route. Again, it’s is long enough that the buses are never particularly busy at any one time. I will say, though, that the 37 is one of the few SEPTA routes that actually has higher productivity during rush hour, so the higher peak frequency probably makes sense. And again, for such a long route, every 25 minutes isn’t bad at all, even if it becomes every 50 for the outer half on weekends.